Al Habtoor Group at Cityscape Global 2015. Al Habtoor Group launched its ultra-luxury residential project, The Residence Collection, Al Habtoor City at Cityscape Global last month just weeks before the opening of the St Regis Dubai, the first of the three super luxury hotels at the mega development, set for this month. Al Habtoor City is a vibrant new neighbourhood in the heart of Dubai, UAE, which was showcased to visitors at the premier real estate exhibition held at the Dubai World Trade Centre from September 8-10. The appearance at Cityscape Global was the first for Al Habtoor Group at the event as it establishes a strong position among the UAE’s leading developers. The entire project offers a total built-up area of 8.5 million sq ft of hospitality, residential and retail space. 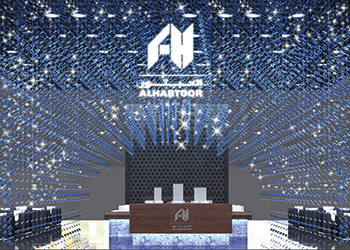 The exclusive Al Habtoor City comprises three five-star Starwood branded hotels (The St Regis Dubai, W Dubai – Al Habtoor City, and Westin Dubai, Al Habtoor City), three luxury residential towers, and permanent Las Vegas-style theatrical production by Dragone – the leading cultural creation company in the world. In addition, there is an array of retail and leisure facilities lining The Boulevard and the Marina Promenade, including boutiques, stylish cafés, signature restaurants, and a tennis academy with four courts, including an air-conditioned court for year-round play. The new community with also incorporate a supermarket chain, a clinic and pharmacy, and more than 5,000 secure car-parking spaces. Real estate developer Tebyan has launched the off-plan sale of the second phase of its popular Sparkle Towers development in Dubai, UAE. Sparkle Towers is expected to be completed by December 2016. The development is being marketed exclusively by property consultancy firm Sherwoods. The sale off-plan allows buyers to make a purchase with a special payment plan that is available at this stage of the development with Sherwoods. The apartments, which will be available for purchase off-plan over a number of sales phases, range from studio size through to three-bedroom apartments and two individual penthouses at the pinnacle of each tower. They are adorned with beautiful Swarovski Crystal workmanship. The lifestyle on offer at Sparkle Towers includes resort-style services such as valet parking, concierge, regular housekeeping service, Swarovski-designed crystal lounge, kids and family-friendly garden, play area, swimming and splash pools, leisure facilities, a female-only health club and swimming pool, underground parking facilities and a high level of security. Other details that enhance the appeal of Sparkle Towers are its location and proximity to a number of attractions. Dubai Properties (DP) has unveiled its new luxurious development 1/JBR, an iconic tower development at the entrance of Jumeirah Beach Residence (JBR) in Dubai, UAE, which offers unparalleled luxury living with every apartment offering panoramic sea views. JBR is a leading destination developed by Dubai Properties Group, renowned for its stunning beachfront setting with a promenade that stretches 1.7 km overlooking the Arabian Gulf. He adds 1/JBR will appeal to discerning local, regional and international investors, who are looking for the highest specification residences in one of the most vibrant destinations in the country. 1/JBR fuses both contemporary and classic architectural and design features in a modern, understated and elegant manner. Encompassing two- to four-bedroom apartments and five-bedroom penthouses with exquisitely crafted interiors, all residences within 1/JBR have a unique glass façade and wide sundecks. 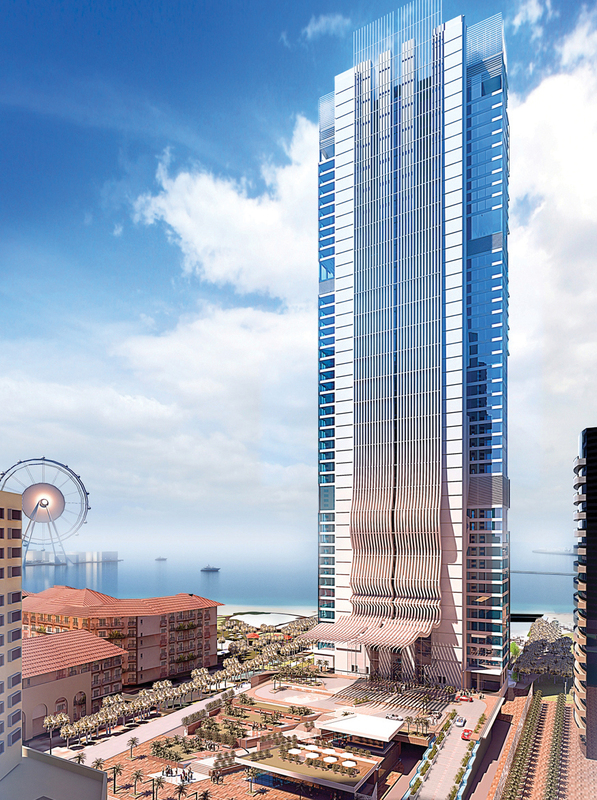 The completion and delivery for 1/JBR launched at Cityscape Global 2015 is set for early 2019. Rayyan Residence ... due for completion in March 2016. 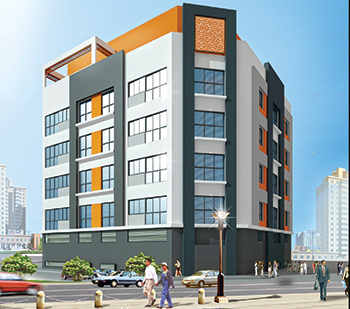 Yaqoob Maklai Interior and Construction has appointed Impact Estate to launch the sale of its new freehold residential development Rayyan Residence in Bahrain. Scheduled for completion by the end of March 2016, Rayyan Residence boasts 16 two-bedroom fully furnished apartments and one lavish three-bedroom penthouse with a maid’s quarter and a spacious terrace of 123 sq m. The high-end development is located on Amwaj Islands and offers panoramic views of the turquoise sea and the Lagoon. With prices starting from BD93,440 ($247,600), the luxurious apartments of 128 sq m and 134 sq m are designed to maximise the living space. Designed by Yaqoob Maklai Interior and Construction, this boutique residence features marble flooring, hand-picked contemporary furniture, quality sanitary ware and bathroom fittings from leading manufacturers. The residents of Rayyan Residence will have access to a number of facilities including a fully equipped gymnasium, swimming pool with seating deck and barbecue areas. Both the underground and above-ground parking lots are designed to provide a parking space for each unit. Aldar Properties, Abu Dhabi’s leading listed property development, investment and management company, has launched West Yas, a new residential project to be built on Yas Island. West Yas is a key component of Aldar’s commitment to create quality, comfortable, and desirable destinations meeting customers’ demand, said a top official. West Yas is located along Yas Island’s natural mangroves and features 1,017 four- and five-bedroom luxury villas, with prices starting from Dh4 million ($1.08 million). The development is a non-gated community with no service charges, and includes a range of community facilities including a mosque built for 2,000 worshippers, two schools, one of which will be operated by Aldar Academies, a retail centre, sports facilities, a petrol station, and extensive landscaping and greenery in the open public spaces. Marketed exclusively to UAE nationals, West Yas will become a major community for Emiratis from across the country, enabling them to live and work in the capital, said Al Mubarak. The residents of West Yas will also enjoy proximity to Yas Mall and the multiple leisure facilities on the island including: Yas Waterworld, Yas Marina Circuit, Yas Marina, Yas Links, Ferrari World Abu Dhabi, and food and beverage outlets located in the numerous hotels on the island, he added. The villas are expected to be handed over to buyers at the end of 2017. Qent Istinye ... award winning. Turkey’s Tabanlioglu Architects bagged the Residential – Built award for its Qent Istinye project in Istanbul at the Cityscape Awards for Emerging Markets ceremony held at the Conrad Dubai in Dubai, UAE, last month (September). The awards are designed to recognise designers and investors of the world’s most high-profile projects. The achievement adds to the several Cityscape awards won by Tabanlioglu Architects since 2005 with various projects like Istanbul Modern, Galataport, Kanyon, DMC Ankara, Levent Loft, Zorlu Centre, Tripoli Congress Centre, Dubrovnik Libertas Hotel, Astana Medya Centre and Bio Istanbul. 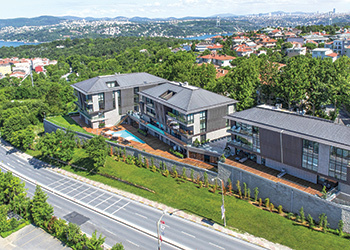 “Our architectural philosophy of creating a synergy between ‘people’ and places’ through our structures is something we bring to life through our projects and to have award platforms such as Cityscape commend our efforts is always delightful”, says Melkan Gursel, partner and architect of Tabanlioglu Architects. Qent Istinye consists of three low-rise apartment blocks, primarily envisaging the projection of the silhouette. Aligned in the direction of the Bosphorus, the transparent façade dissolves in the greenery and opens up to the view whereas the rear side of the building is preferred to be more introvert protecting the sub rosa of the bedrooms facing the existing residential development.